Chalet between Squamish & Whistler, British Columbia. Sleeps up to 4 in 2 bedrooms. Towels and linens provided. Absolute privacy. This 2 bedroom vacation rental is perfect for a stress-free weekend getaway, romantic holiday, an unforgettable honeymoon or a surreptitious elopement. This “quintessentially Canadian” mountain chalet is tastefully decorated with hand-crafted salvaged wood accent pieces reflecting the natural environment surrounding it. The main floor has a homey feel with a full dining room set, area rugs on tile floors, a visible flame heating stove and 2 comfy couches. The 3 piece main floor bathroom presents a Douglas fir slab vanity, a wild-wood mirror, fluffy towels and hand-made soap. The bedrooms, located upstairs, have wall to wall carpet, unique cedar furnishings, and a snug queen-sized bed with cozy blankets and linens. Built and meticulously maintained by the proprietor, the retreat offers guests a taste of a sustainable energy and resource independent lifestyle without sacrificing comforts and conveniences. Central to the most adventure-dense area in Canada, guests can find extreme outdoor sports less than ½ hour away like mountain biking, rock climbing, skiing, zip-lines, white-water rafting and kayaking as well as fishing, swimming, snowshoeing, gondolas and horse-back riding to name a few but may choose to remain on the retreat enjoying the refreshing silence, private clothes-optional hot tub, breath-taking views, and exclusive trails surrounding the retreat. 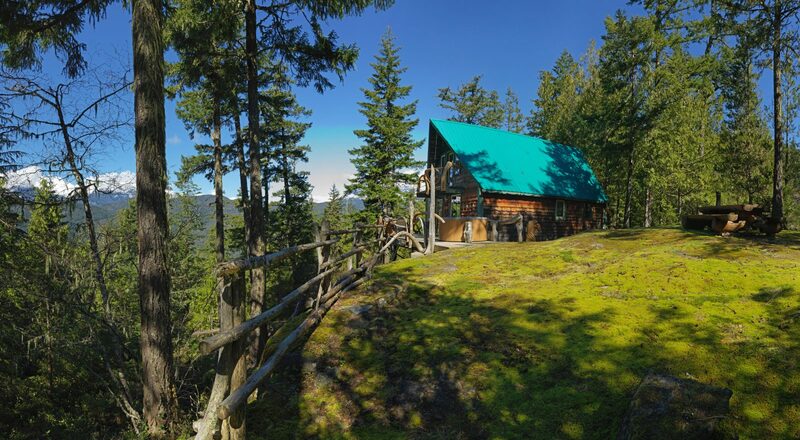 Tantalus View Retreat Chalet is not just an accommodation; it is an unforgettable experience! at the Tantalus View Retreat Chalet? Not only will you be in a convenient location one hour from Vancouver and 20 minutes from Whistler, you will be immersed in enchanting wilderness quite removed from either of those busy places. Tantalus View Retreat was created as a shelter from the world, a peaceful sanctuary away from the hectic day to day grind. The rental chalet is a focal point of the retreat. There are only 2 other buildings on the retreat- the owners log home and a “wild-wood” barn- neither of which are visible from the vacation rental. The retreat is completely “off-the-grid” meaning it is run in a self-sufficient manner without reliance on public utilities, instead using renewable resources and mindfully reducing the carbon footprint. To some "off grid" just means not checking their emails, and there is in fact no wifi in the chalet but it is guaranteed guests will leave better connected! With absolute seclusion and breath-taking vistas, guests will find this adult-oriented accommodation the ideal place to decompress and detoxify, refocus and reconnect! "We are locals to the area but were looking for a nice romantic getaway with a hot tub… well we got what we wanted plus much more!!! Everything was amazing, from the cottage which felt like home the minute we walked in, to the breathtaking views, our hiking adventures, to the warmth and generosity of the hosts. Warren and Rochelle were gracious and attentive hosts as well as wonderful dinner companions and talented musicians – they entertained us with our own private concert and made that evening a memorable one. The only negative comment that I could possibly find is that we didn’t stay long enough. We are looking to repeat the experience in the near future – thank you Warren and Rochelle for sharing your little paradise with us and the heartwarming memories!" "I thought that perhaps there was trick photography used in advertising this place - they seemed unreal. But the photos are accurate - the views of the Tantalus range is as advertised...amazing. The chalet is cozy, and the hot tub is great - especially when the temperature is in the 30s. The property is completely "off the grid" - all electrical power is generated by water power from the nearby stream. We hope to return someday!" "We spent our honeymoon here - and we wish we stayed longer! Every little detail of the cottage is so personalized by Warren and Rochelle. It was beautiful. We can't wait to go back!"